Time for the next round of Battle of the Bands! Stephen's latest battle got me to thinking about my dearly departed sister. She had this album from The New Vaudeville Band, and listened to it frequently. I loved the sound. So today's battle and the next battle will be in honor of my sister. "Winchester Cathedral" is a song released in late 1966 by Fontana Records, whereupon it shot to the #1 spot in Canada on the RPM 100 national singles charts and shortly thereafter in the U.S. on the Billboard Hot 100 chart. It was released by The New Vaudeville Band, a British novelty group established by the song's composer, Geoff Stephens. Stephens was a big fan of tunes from the British music hall era (or what Americans would call "vaudeville"), so he wrote "Winchester Cathedral" in that vein, complete with a Rudy Vallée soundalike (John Carter) singing through his hands to imitate a megaphone sound. Although the song was recorded entirely by session musicians, when it became an international hit, an actual band had to be assembled, with Fontana trying unsuccessfully to recruit the Bonzo Dog Doo-Dah Band. The recording is one of the few charting songs to feature a bassoon. The band toured extensively under the tutelage of Peter Grant, who later went on to manage The Yardbirds and Led Zeppelin. The tune went to No. 4 in the UK Singles Chart. It went all the way to the top in the U.S., however, displacing "You Keep Me Hangin' On" by the Supremes on December 3, 1966. After a one-week run at No. 1, "Winchester Cathedral" was knocked off the summit by the Beach Boys' "Good Vibrations", only to rebound to the top spot the following week. After two additional weeks, it was knocked off the top for good by "I'm a Believer" by The Monkees. "Winchester Cathedral" topped the Billboard Easy Listening chart for four weeks. Alright now, it’s time to cast your vote! In the comments, please enter who you are voting for and why you chose them. Voting will close March 7th @ 6pm EST Stay tuned, results will be posted on the 8th! Thank you, Cathy! A vote for Petula Clark is logged into the books. I loved that New Vaudeville Band album. My mother also had a copy and I used to play that thing til it just about wore out. I think she used to also have that Sinatra album as she had a bunch of his albums which I also used to play often. Pet Clark was also a favorite of mine. I had a crush on her when she first appeared on the pop scene with "Downtown" and later saw her perform live in Toronto in 1981. Regarding this song, neither version achieves what New Vaudeville Band accomplished for my musical taste. Frank is frank with his swinging interpretation--not always my favorite Sinatra style, but I can't knock it much. Petula delivers a more appealing version to my ears. My vote goes to Petula Clark. Thanks for stopping in! I'll be around a little bit later in the day. I've decided to vote for Petula Clark. I'm sorry you lost your sister. As the youngest in my family I wonder when that sort of news will reach me. We're all pretty young yet but you never know. ~hugs~ Be well! She does have a pretty great style. I've got you down for Petula Clark Thanks for stopping by! Here I come to save the d-aaa-y! I'm pleased that I inadvertently helped inspire this Battle. It's an easy, Easy, EASY vote for SINATRA to kill this shutout dead, Dead, DEAD! There's a song by the Bonzo Dog Doo-Dah Band titled (something like...) 'My Brother Makes The Noises For The Talkies'. Ha! Such a fun novelty song that I immediately think of any time someone mentions the Bonzo Dog Band. Thanks for saving me from the shutout! I listened to a whole variety of versions of this song, and there were none that I felt that would have a smidgen of a chance against the New Vaudeville Band. I do have a favorite of the two contestants, but will save that information for the big reveal. It's crazy to think that this song was popular in 1966 because I was just a baby then. I'm sure I must have been closer to 4 or 5 when I first discovered the song. The opening bah-dah-dee-bah-dah reels me right in! The megaphone and the whistling, too! Oh my! You doing THIS song inspired me today to put on a CD I have of very, very old music. And as I was listening, my favorite track played and I thought: I MUST USE THAT SONG IN A BOTB!! It's not "megaphone", but it does have that "antique" sound. So, I just got done looking into it at YouTube and they DID have what I wanted, plus a bunch of really worthy competitors. This will be my next Battle. Now all I have to do is agonize over narrowing down the 4 or 5 competitors to 1. GAH! Glad I could be of service to you. Sorry for the late response. I was kidnapped yesterday and forced to work for wages in the afternoon and all day today. I would have had to work tomorrow as well, but the manager I was covering for had forgotten that she already had someone else covering her Saturday shift. Oh yes, I do like a little extra meat in my paycheck. Well this was a toughy. Loved both versions. I think I'll go with Petula on this one. She has just a bit more snap and pep in her voice. Although this should be a sad song, it just doesn't "sing" that way to me. I liked this song when it first came out, and since the heck hasn't been played out of it, it's still a favorite. I liked both covers. Pet's version had saome funky organ in it, while Frank's could have used a few "hey! "s at the ends of lines (he did a few at the beginning of lines), e.g. "Winchester Cathedral... hey! You're bringin' me down." Give my vote to Frank! Thanks, John! I don't think I recall that episode, but it sure looked fun! Appreciate you taking the time to stop by! I really liked Petula Clark on this one. This is starting to look like a clear winner. I've got your vote for Petula Clark counted. Thanks for stopping in! I'm sorry you lost your sister, Mary. This is a lovely tribute, though. ♥ The original Winchester Cathedral is too firmly ingrained in my memory banks to really like either of these remakes. Frank's style doesn't really suit it. At least Petulia sticks to the spirit of the song, so she gets my vote. Thanks, Debbie. It's hard to imagine that she's been gone for almost 21 years now. Time sure does fly! Being that we were the only 2 girls we shared a room, and I was greatly influenced by her musical choices. I vividly recall waking each morning to a situation similar to Groundhog Day, It was either The Carpenters or Donny Osmond that played on her radio first thing in the morning. 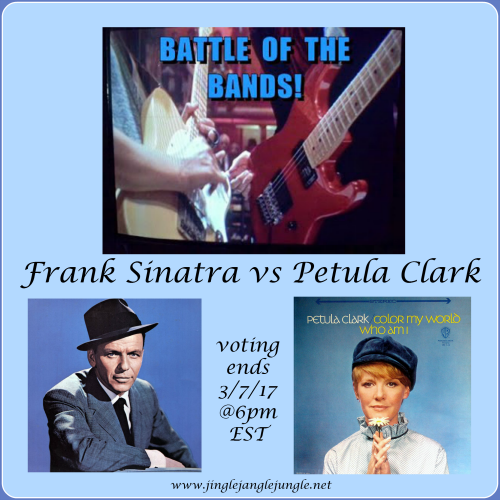 I've got your vote for Petula Clark counted. I truly appreciate you taking the time to stop by to cast your vote. A vote for Frank Sinatra it will be. 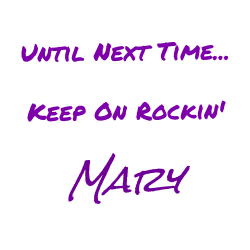 Appreciate you stopping by! It is a close one but Sinatra gets my vote! Another vote for Sinatra in the books! This battle is looking up!